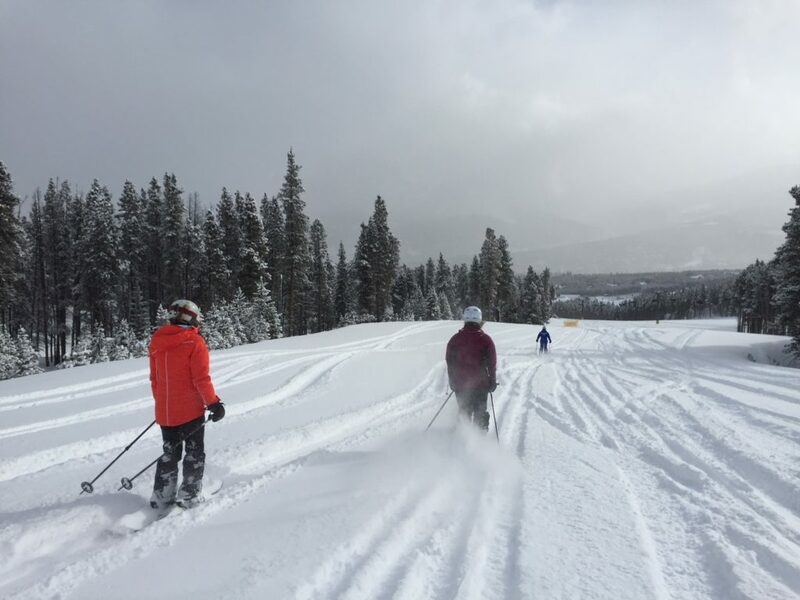 I am so glad I took the three-day Women’s Camp at Breckenridge Ski Resort and I want you to feel this way too. Besides the many pleasant surprises that came with the camp, my skiing improved tremendously and it was a blast. 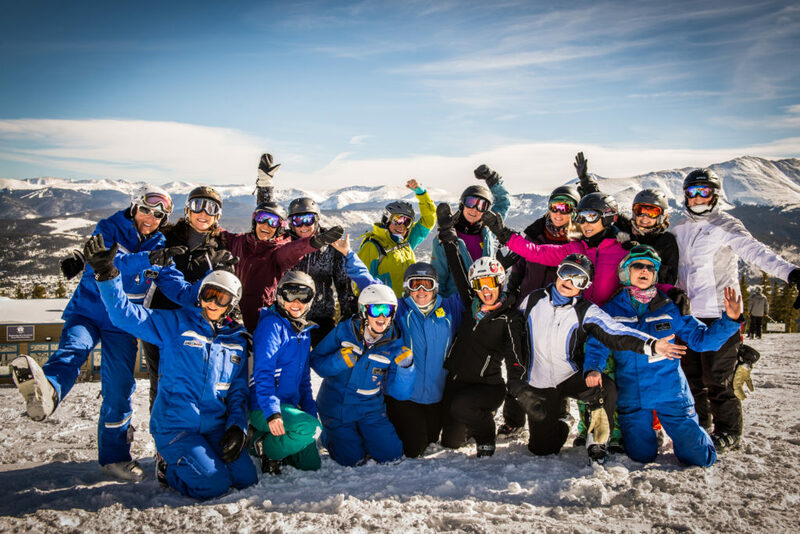 No matter what level you are – from never trying skiing before to skiing one week every three years or if you live by a mountain and ski as much as you can – there is something that you will get out of this three-day Women’s Camp. 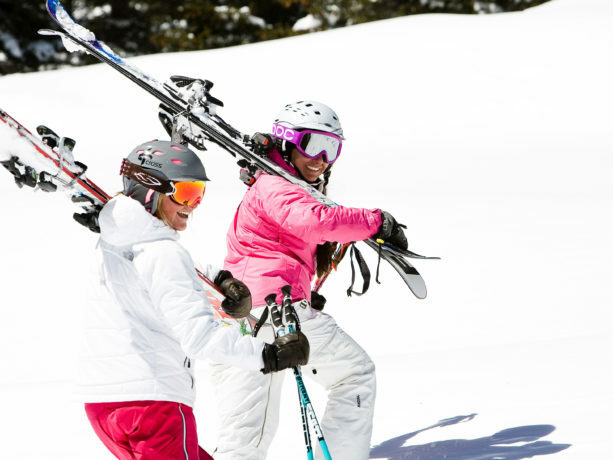 The camp is a part of Women’s Ski Week and it takes place in February at Breck. I definitely recommend booking ahead of time so you don’t miss out. Before the first day of camp, you are emailed instructions, a schedule for the camp and a short list of questions. As a student of the camp, you’ll answer the questions honestly, explaining what your skiing experience is, what type of runs you enjoy skiing and what you’d like to get out of the camp. This helps the camp planner choose the perfect instructors and begin with an idea of who will learn with who. Of course, this is a flexible pairing – if you’d like like to go at a slower or faster pace, it will be accommodated at any time and they’ll even bring in other instructors if needed. The focus is to give proper attention to each student and I was personally very pleased and comforted knowing that. There ended up only being three of us students with our wonderful instructor, Keta. On day one everyone met up for breakfast and social time before the lesson. Lots of laughs were shared and bonds started to form between all of us females. We were a well-represented group with females of all ages – 20s to 60s and all skiing ability levels, there were no cliques, just fun conversations. I think we were all a little excitable, a little nervous, but most of all we were open to seeing what the next three days held. We began the first day with our pre-matched groups and run/lift decisions are all collective. The instructor would choose exercises and drills that help teach the specific skill that the group is working on. I was thoroughly impressed by the individualized attention everyone was given – I truly felt that Keta was helping me through each section of the trail. To break up the days, a complimentary snack break with hot chocolate or coffee is provided along with free lunches each day. The group sets goals each day and then works to meet them. At the end of each day, there were a few surprises which I’ll explain below. Keta was so wonderful, in the end, she even made sure we all had her contact information and offered for us to give her a call if we’d like to have a fun ski day together – not on the clock. How awesome is that? 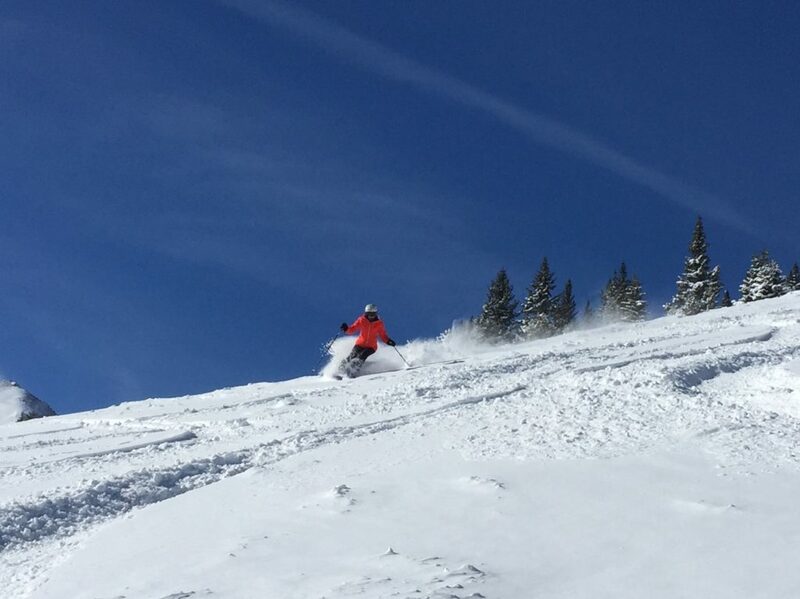 I truly felt like I made personal connections and improved my skiing in just three days! Surprises were bountiful and truly unexpected. When I first signed-up for Women’s Camp, I didn’t realize that all of the activities that I ended up participating in were included in the cost. It started with a complimentary Welcome Reception the night before day one of the camp where there was free food and drinks plus the opportunity to meet other women in the camp. 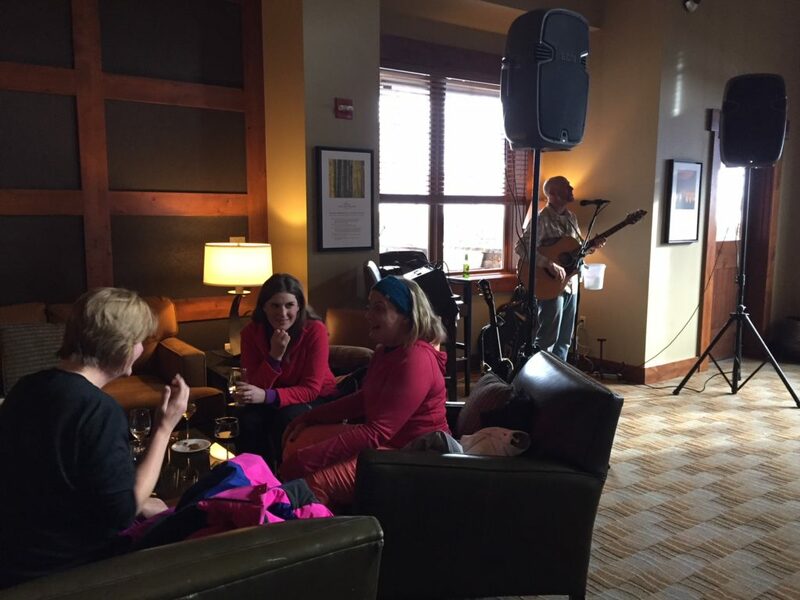 I showed up to the lounge area of River Mountain Lodge in Breckenridge and enjoyed talking and meeting everyone in a comfortable setting. The next morning, the larger group met up for breakfast at One Ski Hill Place’s, The Living Room, where we have a great fueling meal and were given swag bags. 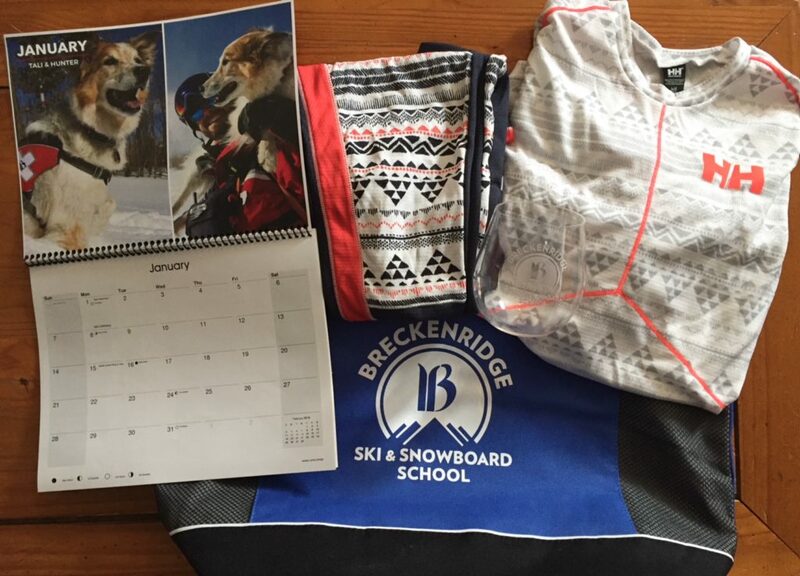 I did not expect a swag bag and inside the insulated cooler bag (big enough for BBQ supplies) were Helly Hansen base layers (a top and a bottom layer with trendy patterns), an adorable Ski Patrol Dog calendar, and a branded traveling cup. Once the day of lessons began, we had a chance to discuss our goals, fears, and thoughts on the chairlift rides and then practice down the slopes. I forgot that all Ski School lessons get to use the Ski School Lift Line which bypasses the other lines and gets you on the lifts faster. Now, this was so wonderful every run – at first, I felt bad for going in front of others, but then I realized it’s like any other benefit that one pays for and guests at the resort were nice and kindly let us go ahead. 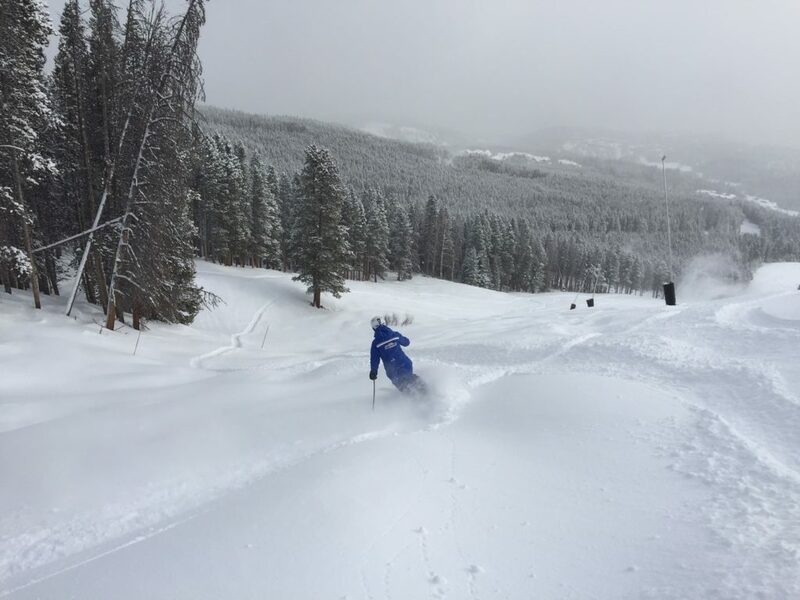 The second and third days of camp happened to be snowy days and the fast line came in extra handy – we were able to get in more runs, get great snow and work on our skills quicker. The three days of free lunches at the on-mountain restaurants were a lot of fun to try out dishes that I might not have tried before and the snack/hot chocolate or coffee breaks were additional delights. 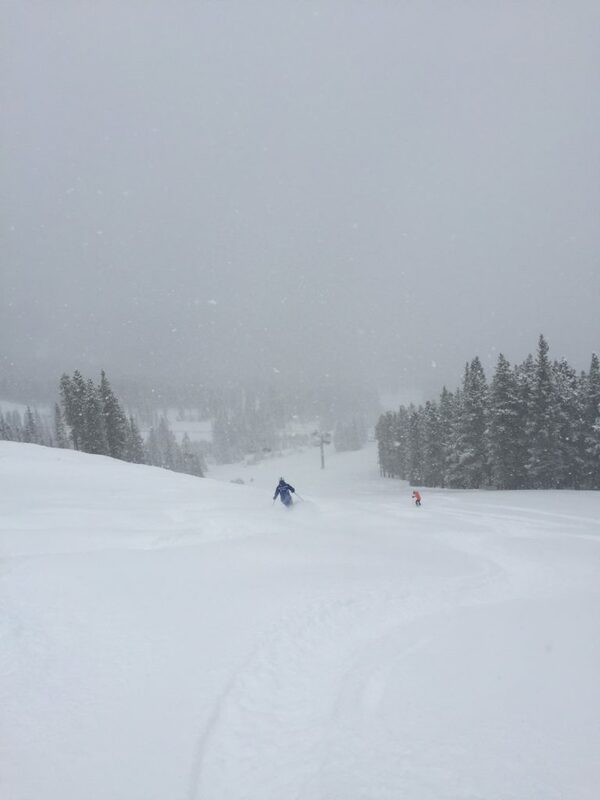 On the second and third days of camp, we were allowed to load the lift early before the lifts opened to the public giving us first tracks down the mountain. You feel like a true VIP and those runs were definitely some of the best turns I had over the three-days. There are groomed (fresh corduroy) and ungroomed runs (powder those days) to choose from, depending on what you like. We did choose the powdery spots as you can see below. Fresh snow on day two of Women’s Camp! 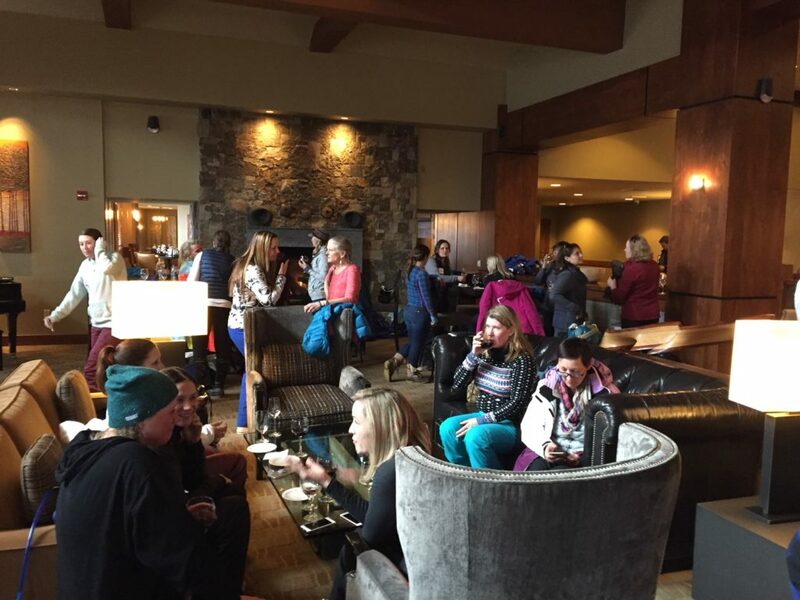 After each day of camp, there were activities that were part of Women’s Ski Week that were included in the Women’s Camp purchase including jumping in on the end of Women & Wine which included a fun wine happy hour (all complimentary) in One Ski Hill Place’s snow-level lounge area (seen below.) Ladies and Lagers took place the following day which was a beer and food pairing at the scrumptious 9600 Kitchen inside of Doubletree by Hilton Hotel Breckenridge (complimentary as part of Women’s Camp.) And a closing week party took place on the last day at Park Avenue Pub featuring food and drink specials. Besides improving our ski technique, the instructors and camp planners wanted to make sure each of us students had the chance to learn about the equipment that makes skiing easier, so a boot talk and separate ski talk were held with professionals to answer everyone’s questions. During lunch, on the last day, we had a heart-warming and joke-filled awards party. Alongside the added surprises, the improvement potential for each skiing student is infinite. It’s hard to improve on something without consistency (that’s where the three days in a row comes in) and it’s hard to improve without someone there to fix any potential bad habits (that’s where the professional instructors come in.) 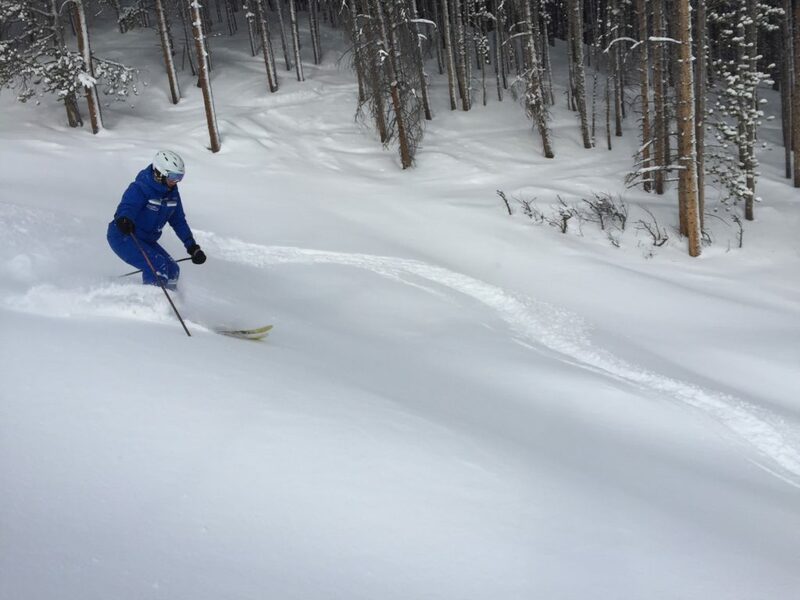 A friend once asked a child student in a school classroom “What does potential mean?” and the student responded, “it’s your superpower.” That’s one way to look at – you have the power to improve your skiing and it’s a gift to yourself to take the time to do it! When improving any part of your life, a coach of some sort can only make it better – whether it’s a mentor in your career, a health coach, tennis, golf, skiing, music, art, anything really. I went from a confidence level of a four to about a nine. The only reason I don’t put a 10 is that I feel as though there’s always room for a little improvement – including my confidence – but that jump from four to nine was monumental for me! And the friendships can’t be overlooked. The other woman in Women’s Camp were a true pleasure to be around and learn with. I would say it is 100 percent worth the (very reasonable) cost. 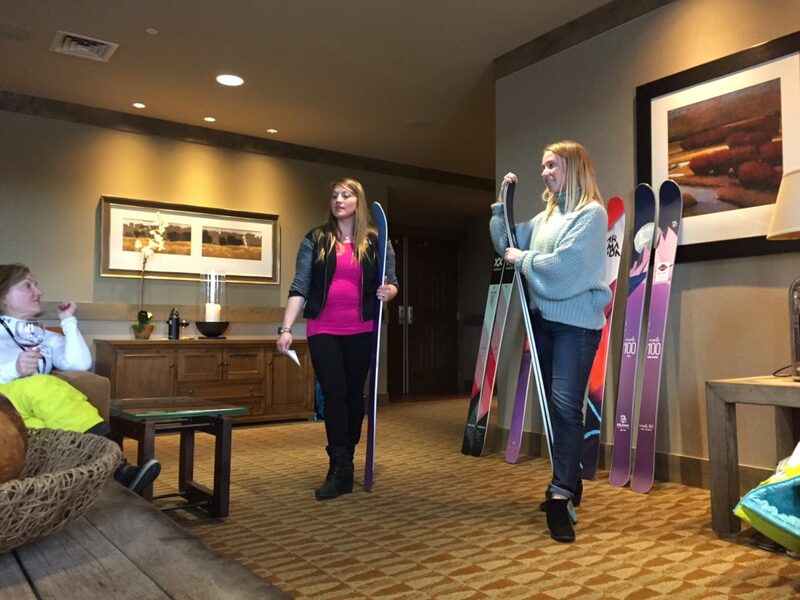 If you’re ready to “do something today that your future self with thank you for” (Sean Patrick Flanery), sign-up for the next Women’s Camp during Women’s Ski Week at www.womensskiweek.com. 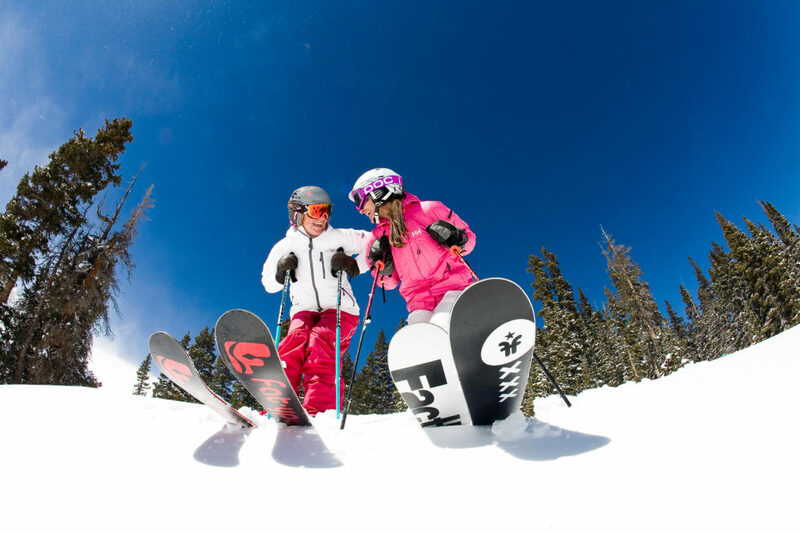 If you need lodging, find lodging deals at www.breckenridge.com/deals. Hope to see you in class in future years and let us know below how lessons have helped you!